The two Russian cosmonauts living aboard the International Space Station ventured outside their orbiting home today and successfully cut away a rubbery O-ring seal that was preventing an unmanned cargo freighter from properly docking to the complex. The seal is believed to have been left by the last supply ship. Marking the 30th spacewalk devoted to International Space Station assembly and maintenance, Expedition Three crew members Vladimir Dezhurov and Mikhail Tyurin began the excursion at 8:20 a.m. EST, about 10 minutes ahead of schedule. Russian flight controllers had budgeted five hours and 40 minutes for the spacewalk to remove the obstruction that was preventing the Progress 6P supply ship from firmly docking to the outpost. The freighter's docking probe penetrated the aft port of the Zvezda service module and was captured during last Wednesday's link up. However, the debris prevented the probe from fully retracting as designed to bring the craft and station together in a tight fit. The end result was the inability of eight latches to engage that would firmly hold the Progress in place for its 80-day stay at orbiting complex. As suspected by Russian engineers, the debris was a rubbery O-ring seal that ran the full circumference of the docking port. The seal is believed to have been left there by the last Progress when it undocked on November 22. As the spacewalkers moved into position, the Progress' docking probe was extended slightly, creating a gap of several inches around the docking mechanism while keeping the craft attached to the station at all times. The gap allowed the spacewalkers access to the O-ring debris. They used cutting devices to snip the O-ring into pieces for quick removal. Officials told the crew to bring the seal back into the station so it can be returned to Earth for analysis. 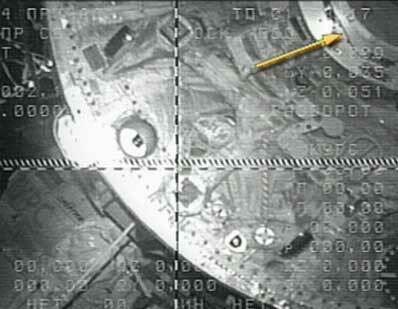 With the obstruction gone, the Progress' docking probe was commanded to retract. Unlike the original docking attempt last week, this time the probe retracted fully and the eight latches inside the docking mechanism engaged to firmly hold the freighter to the station in a so-called "hard docked" state. This was confirmed at 9:54 a.m. EST. With no other objectives for the spacewalk, Dezhurov and Tyurin took some pictures before returning to the airlock. The hatch was closed at 11:06 a.m. EST to conclude the two-hour, 46-minute EVA. At Kennedy Space Center, meanwhile, preparations continue for Tuesday's launch of shuttle Endeavour to the International Space Station. Liftoff is scheduled for 5:45 p.m. EST, about 20 minutes after sunset on the east coast of Florida. Endeavour will ferry the Expedition Four crew -- commander Yuri Onufrienko and flight engineers Carl Walz and Dan Bursch -- to the station to begin their five-month stay. The shuttle will return to Earth the Expedition Three crew of commander Frank Culbertson and cosmonauts Vladimir Dezhurov and Mikhail Tyurin after their four-month voyage in orbit. Endeavour was supposed to have launched last Thursday, however, the failure of the Progress to completely latch into position forced NASA to scrub the blastoff. Thursday's attempt was called off to allow engineers more time to ensure it was safe for Endeavour to dock to the station with the Progress in its wobbly state. Analysis showed the Progress was secured enough to prevent it from rocking back and forth from the forces imparted by a shuttle docking. But the space agency ultimately decided to postpone the shuttle launch until after this spacewalk. 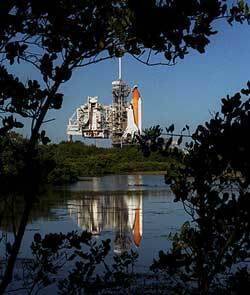 The shuttle mission is slated to last 11 days with landing scheduled for December 15. The Russian Progress cargo ship makes an automated docking to the Zvezda service module of the International Space Station on Wednesday.